I have included the php code sniffer in PhpStorm 6.0.2. 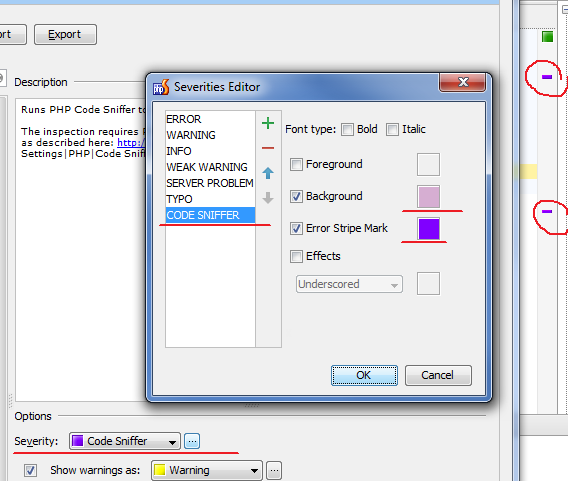 The results are shown in the code sniffer moment as a warning. Can I change the color of the presentation? I'm confused. Other than the ability to change them as in your screen shot? I want to check the scripts with the code sniffer. The results of the inspection are displayed in the editor window with a color. Errors are indicated by the red color. Can I set a custom color for the result of the sniffer code. So ... what is the problem? Next time CodeSniffer will run (e.g. after adding a space character, for example) the markers will have new custom color.